Continuing my trend of reading old railway books, I recently read “Canadian Pacific Railway” by Patrick C. Dorin. This book was published in 1973, so it is more than a little dated. 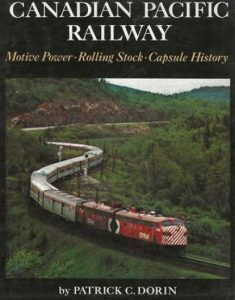 This 176 page book covers the Canadian Pacific Railway from the confederation of Canada and the tumultuous start of the CPR, through its rapid growth in the early 20th century, the transition from steam to diesel and the precipitous decline in passenger service. The four appendices list steam power, diesel power, freight and passenger equipment. All photos in this book are black and white, which is unfortunate (in my opinion) but to be expected for the year that the book was printed. A lot of the photos are roster photos, but there are a fair number of “action” photos from photographers such as Jim Scribbins, Elmer Treloar, Jim McRae, Gerry Burridge, Harold K. Vollrath and Dale Wilson. I’d like to say that I liked this book, but I think it’s more accurate to say that I liked parts of this book. I found that the author described different aspects of the CPR in wildly different levels of detail. For example, the Dominion Atlantic Railway (a rather interesting internal shortline of the CPR in Nova Scotia) was afforded 2/3 of a page, the Esquimalt and Nanaimo Railway (on Vancouver Island) got one column, while the Duluth, South Shore and Atlantic got its own 9 page chapter. I guess you write what you know, and maybe the author was far more familiar with the DSS&A as an American living in Minnesota. I should mention that Dr. Dorin passed away on November 18, 2014 at the age of 75. He wrote about 35 books, mostly on railroads. As I said, I liked parts of the book, but I can’t really recommend it as the definitive book on the Canadian Pacific Railway. If you’re interested in the CPR, I recommend either Tom Murray’s “Canadian Pacific Railway” for full coverage of the CPR, or Greg McDonnell’s “Canadian Pacific: Stand Fast, Craigellachie!” for an entertaining and engaging look at the CPR. Once you have those two, then you should consider Mr. Dorin’s version as well for an earlier look at the CPR. Amazon links in this post are affiliate links, meaning I earn a small commission when you buy something after following that link, at no additional cost to you.